Big Brothers Big Sisters of Central Texas’ new Bennett-Rathgeber Mentoring Center has won an Austin Energy Green Building 3-star energy award. The award honors community structures that support a cleaner environment through efficient water and energy use and that provide healthy, comfortable spaces for staff, clients or residents. The new mentoring center is part of the Mueller Redevelopment, a LEED Gold Neighborhood Development certified by the U.S. Green Building Council. The eco-friendly building opened its doors on January 25, 2016. Although the mentoring center is four times larger than the agency’s former facility, it takes only twice as much energy to run. A number of innovative features reduce energy use. The facility’s core support spaces use natural light reducing the need for artificial lighting, and an energy-efficient HVAC system reduces the system’s run time. Situated on a public bus route, the building offers easy public access without a car, reducing gas consumption and emissions. The building design also supports increased physical activity and employee wellness. On the second floor, the Youth Activity Center provides a place for Bigs and their Little Brothers and Sisters to relax or play games. During the week, staff use the space to practice yoga. Big Brothers Big Sisters is proud to be part of such a forward-thinking community that supports a cleaner, healthier environment. The site of a former municipal airport, Mueller offers a sense of community and multiple amenities. A blend of commercial and residential spaces, the Mueller neighborhood boasts parks, restaurants, a grocery store, apartments, and homes, all within walking distance. Big Brothers Big Sisters’ new building aligns with the agency’s mission of creating brighter, healthier futures and outcomes for children. 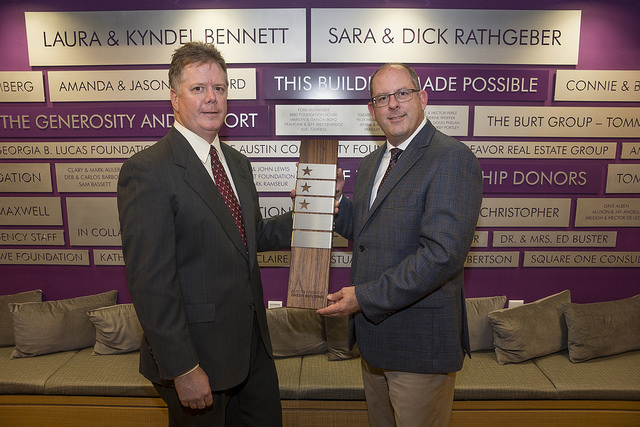 The award was presented to BBBS’ CEO Brent Fields at a national Green Building Sustainability Celebration held at the Bennett-Rathgeber Mentoring Center on November 14th. Photo credit Arnold Wells/SK photo. Images provided by Austin Energy. 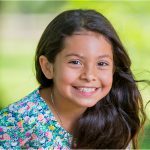 Big Brothers Big Sisters serves nearly 1,000 children in Travis, Williamson, Hays and Bell counties every year. For more than 46 years we have matched children, ages 6–16, with supportive adult mentors who build friendships and offer encouragement and support to each child, helping them discover opportunities and build skills that lead to success in life. 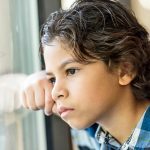 Last year more than 98 percent of the children served by BBBS remained in school, improved or maintained their grades, and avoided early parenting. Children served by our program also attend college at rates that are twice the national average for their peers. For more information, visit www.BigMentoring.org. Since 1991, Austin Energy Green Building (AEGB) has been cultivating innovation in building and transportation for the enrichment of the community’s environmental, economic and human well-being. This mission is achieved through green building ratings, consulting services, code advancement, education and professional development. AEGB ratings raise the standards for energy efficiency, water quality and conservation, community compactness and connectedness, indoor environmental quality, material recourses and site development. The AEGB ratings are specific to Austin and reward sustainable building practices on a scale of one to five stars. U.S. Green Building Council’s LEED (Leadership in Energy and Environmental Design) is a green building certification program that recognizes best-in-class building strategies and practices. To receive LEED certification, building projects satisfy prerequisites and earn points to achieve different levels of certification. Prerequisites and credits differ for each operating system, and teams choose the best fit for their project.